Philadelphia residents and born natives are proud of our cheesesteaks. We all have our favorite places to get them, but for some of you that haven’t been to Philly yet, I am going to break it down to you like this. You want good bread, fresh ingredients, cheese and of course most importantly good cuts of meat. I have been a fan of different cheesesteak places in Philly, but I would always hear people say, “did you try Tony Luke’s yet?” My response was always no; until now. 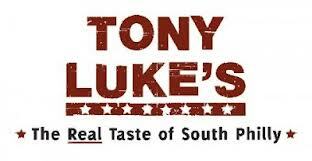 On Saturday, my little family and I headed down to the Original Tony Luke’s. The place was booming. That day there was a fundraiser going on for Michael Strange, which I thought was fantastic. That this was going on in 1 of Philadelphia’s most popular places. I had the pleasure of sampling everything on the menu and I have to say my mouth is still watering thinking about some of these sandwiches… and the Caramel, Sea Salt Sweet potato fries. This isn’t your typical Cheesesteak shop. They also have Philly Style Sandwiches. The sandwich that a lot of people talk about from Tony Luke’s is the Roast pork with provolone and broccoli rabe. This was outstanding! The pork meat was moist and tender. The broccoli rabe was delicious, with no bitterness. I had the cheesesteak as well, with peppers, onions, mushrooms and cheese. The meat is sliced thin, and all the ingredients are fresh, not canned. These sandwiches are seriously packed with so much flavor. If you’re ever in Philadelphia and find yourself wondering where to get a cheesesteak from, please do me a favor and swing by a Tony Luke’s and you will know what Philly has to offer in a cheesesteak. Kudos to Tony Luke Jr, Nicky and the rest of the staff for the real taste of Philly! Tony Luke’s all the way for me, too!